Although the menu possibilities are endless, I find almost nothing more satisfying than a well-made hamburger. Over the years, I have toyed with countless recipes in an attempt to build a bodacious burger. I've experimented with versions of the famed "21 Club" burger, which necessitates myriad ingredients and spices; I've made cheeseburgers where the cheese was blended right into the meat; and I've tried just about every blend of beef, pork and lamb possible. Thankfully, though, the most satisfying burger formula I've found is also one of the simplest, not to mention economical. For a little more than the price of a Happy Meal, you can make from-scratch burgers at home. But, that's the key: FROM SCRATCH. 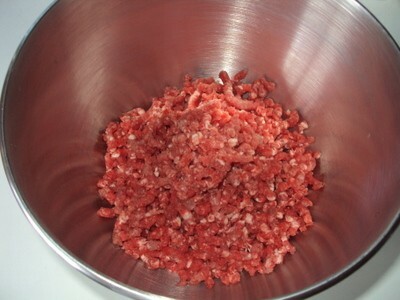 The secret to making a truly great burger is grinding the meat yourself, just prior to cooking. Here is how I do it: After experimenting with all sorts of burger blends, I've found that the most satisfying -- incredibly flavorful AND juicy -- is a ratio of about 85% chuck and 15% sirloin. This provides a nice beef-to-fat ratio. The ratio doesn't have to be exact; just try to get somewhere close to 85/15. You can eyeball it. 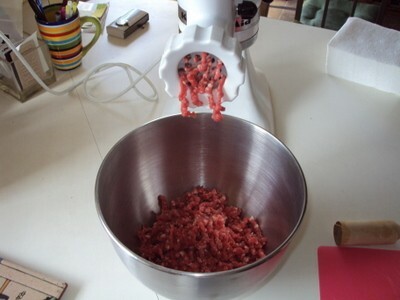 I have a KitchenAid stand mixer with a grinder attachment that I employ when I make my burgers. It's indispensable. However, if you don't own a meat grinder, most supermarket butchers will happily grind your meat for you. You could also use a food processor, although the grind won't be quite right. 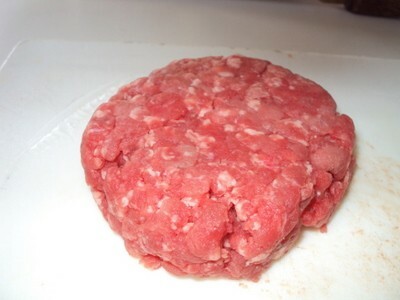 Buy a piece of chuck (not ground) and some sirloin and put the meat in the freezer for about an hour before preparing the burgers.Partially freezing the meat makes it easier to cut and grind. 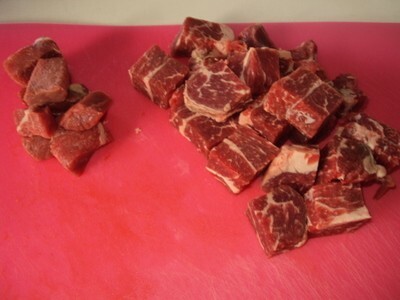 Then, simply cut the beef chuck and sirloin into cubes about an inch square and feed them into the meat grinder together -- no need to separate the two cuts of meat. Once the beef is ground, one key to making great burgers lies in not over-handling the meat. Be gentle. 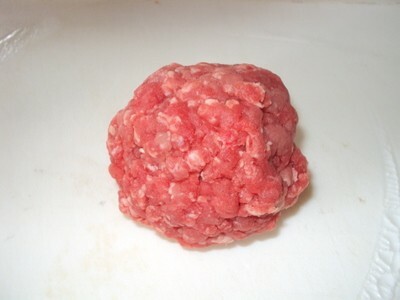 Form the beef into loose spheres -- just so the meat hangs together. I make burgers that are about 1/3 lb. each. Next, gently press the burger balls into patties. Again, don't overwork the meat. You want burger patties that don't fall apart, but you don't want the ground beef to be pressed too tightly, either. As I said, there was a time when I used all sort of seasonings in my burger blend, everything from coriander and Worcestershire sauce to onions and garlic. And, you can do whatever you want with your burger. However, I've discovered that the best burgers are the ones where the beef is front and center. I want my burger to taste like MEAT, not a hodgepodge of other ingredients. 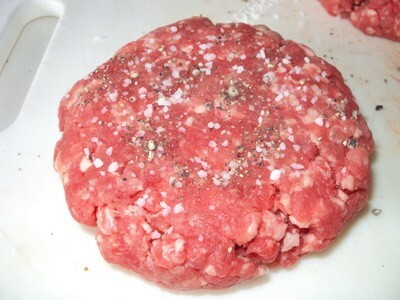 Therefore, I simply sprinkle a generous amount of kosher salt and freshly ground pepper on my burger before cooking. That's all. Then, while grilling the burger, I add cheese (which, of course, is also optional). You can cook your burgers rare or well-done or anything in between. I've learned that cooking a one-third pound burger for about 3 minutes per side over medium-high heat results in a juicy, medium-rare burger. While grilling your burgers, again, be gentle. Don't press the patty, as that will squeeze out valuable juices and create flare-ups. 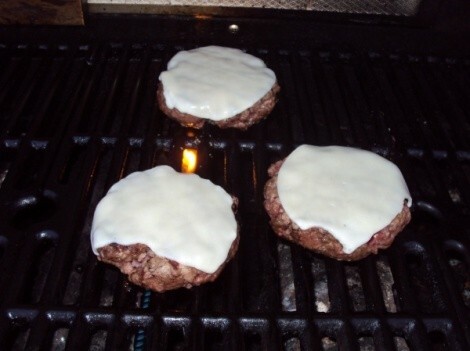 Just place the burger on the grill and turn it once, adding the (optional) cheese after turning the patty. That's all there is to it.